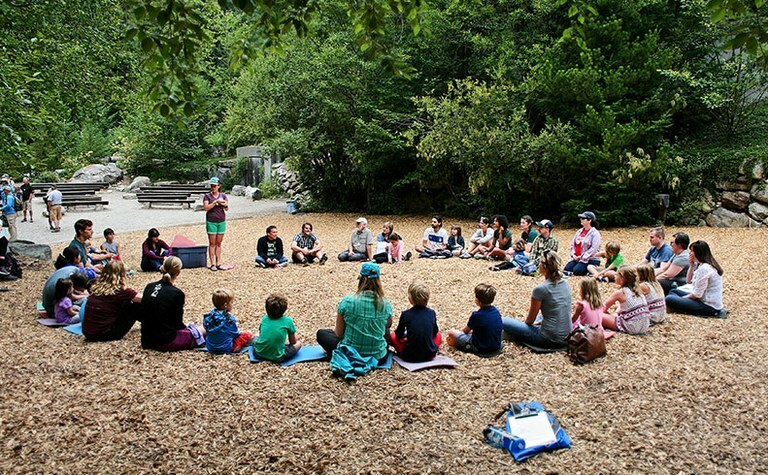 Connect with your family – and nature too – on the shores of Diablo Lake. Spend quality time together while enjoying the invigorating mountain air and starry night skies of North Cascades National Park, one of the most spectacular wilderness landscapes in all of North America. Enjoy a weekend in the mountains and leave your tent and camp stove at home and let us take care of all the details. We provide comfortable accommodations in our cozy lodges and delicious, healthful meals, with the tastes of young diners in mind, served buffet-style in our lakeside dining hall. The most difficult choice of your weekend may be which activities your family wants to join. Will you follow our naturalists as they lead paddling adventures in our 14-person Salish Dancer canoe on Diablo Lake? Do you want to take part in daily outdoor games, arts and crafts, storytelling and scientific explorations? Should you spend the day hiking to spectacular views of local glaciers or simply relaxing with a book in the Wild Ginger Library? With our inspiring slate of activities designed to introduce adults and children of all ages to the wonders of the natural world, you'll be able to shape your own itinerary to create the perfect weekend retreat for your family. * Note: Activities change throughout the year depending on the weather, seasonal opportunities, group interest and abilities. We welcome groups that include parents, grandparents, children, guardians, aunts and uncles and nontraditional families. Children ages two and younger can be added to the family registration at no charge. Children are the responsibility of a parent throughout the program. Scholarships are available for Family Getaways! Please visit our Scholarship page for more information or call (360) 854-2599. This is a wonderful way for our family to spend time together. As parents we get to watch our children engage in activities led by mentors other than ourselves.... We had a fabulous experience." The bar had been set high before we came. It was great and would be hard to better." This weekend was so much more than we anticipated. Thank you!" A 'Top Adventurous Family Vacation You Can Afford'... the Environmental Learning Center as "not only a place to learn about conservation and stewardship but also a great getaway to relax and have fun!" North Cascades Environmental Learning Center’s weekend Family Getaways offer a premium “camping” experience and you’ll love it..."
Hidden high in the North Cascades National Park, you’ll find that the North Cascades Environmental Learning Center offers the best base camp for families and individuals who want the ultimate outdoors experience..."
Known as a 'hub of discovery in the North Cascades,' this is a place where science, wilderness and environment are equal to fun and adventure, where people and place are connected..."